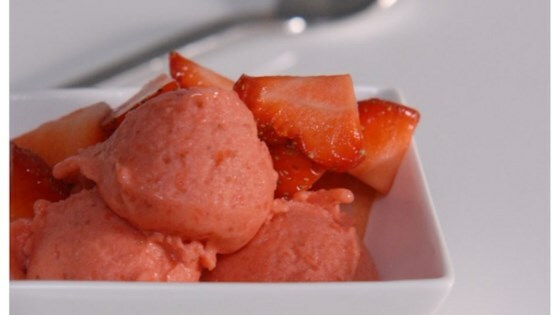 "Sweet, soft strawberry sorbet that will rival any brand bought in the grocery store. Not being able to find the perfect recipe, I made up my own! Most homemade sorbets resemble an icy slushie, but this one is thickened before freezing, yielding a melt-in-your-mouth treat that will please even the pickiest sorbet lover! Dually great because it can be made in an ice cream freezer, or in your regular freezer." Place berries in the work bowl of a food processor and puree until smooth. Combine berry puree, sugar, and salt in a large saucepan. Heat until melted and just simmering. Whisk cornstarch into the cold water; stir into heated berry mixture. Remove from heat, and stir in lemon juice. Cool slightly. Refrigerate berry mixture until cold, about 2 hours. To freeze this sorbet without an ice cream maker; pour strawberry mixture into a shallow dish, place dish in freezer, stir occasionally until sorbet reaches desired consistency. meh. It was more like frozen jelly than a sorbet to me. Overly sweet - and the texture was off... love the idea of this recipe, but it just didn't fly for me. This was a great way to use up some almost too ripe strawberries. The sorbet was very silky and smooth for the first day and is fairly smooth even 3 days later. I will definitely make this again. Such an easy recipe and so good. Good daiquiri base as well!